Louis Daniel Armstrong (4. srpna 1901, New Orleans – 6. července 1971, New York) byl americký jazzový trumpetista a zpěvák. ...the greatest jazz musician that's ever been. 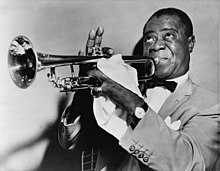 ↑ Louis Armstrong, Jazz Trumpeter and Singer, Dies. nytimes.com [online]. 1971-07-07 [cit. 2015-11-01]. Dostupné online.